Settle in for an out-of-my-norm-but-read-it-anyway review, bookhearts. An ex-agent is on the run from former employers. She worked for the U.S. government until they decided she was a liability. She just knew way too much! So now she uses fake names, wears disguises, travels light and often to stay low-key. Until one day she is offered a way out: take one more case to clear her name and save her life. This woman is a beast! Known in the dark world as "the chemist," she strikes me as a cross between Huck from Scandal and Mr. Kaplan from The Blacklist. Her tactics are brutal yet efficient. Her strategies are well-planned. Her very own life is priority. But then she falls for the subject, making her likelihood of survival complicated. It is so hard to imagine this is the same author that wrote the Twilight series (which I loved btw). 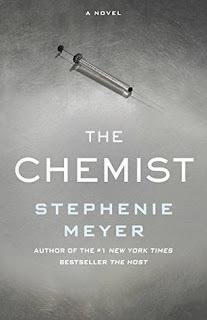 Yeah, it is clear why Stephenie Meyer is a worldwide bestselling author but with this new release, her writing has matured. It still has her descriptive signature style but with a grown feel to it. There are no vampires, werewolves or naive teenagers. The characters in The Chemist are intelligent adults who make realistic decisions. It is very black ops and would be perfect for the big screen! Granted, there are some parts that are too wordy and could be removed, hence my 4.5 / 5 heart rating. But I was all in, turning the pages of this thick 500+ page hardcover until the gasping end. Dare I say I didn't want it to end?! 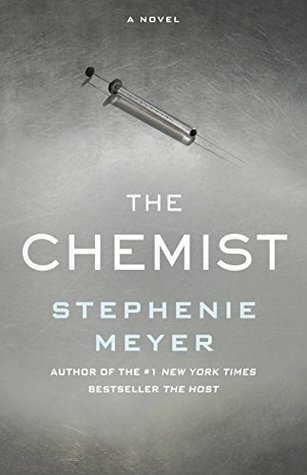 Bookhearts, give The Chemist a try. It may or may not be your cup of "guhment" tea but I highly recommend it for fast-paced action/suspense book lovers. For my conspiracy theorist bookhearts, this one is for you!